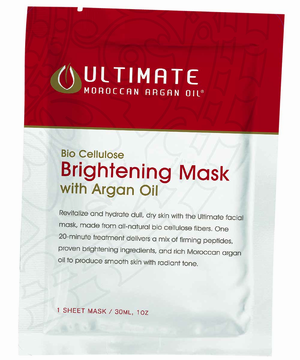 The ULTIMATE Moroccan Argan Oil� Brightening Facial Mask is the fast, convenient way to brighten your complexion. Its unique bio cellulose fabric binds tightly to facial contours and transfers skin care ingredients more efficiently than any other mask. In one-20 minute application, your skin will feel soft, supple and intensely hydrated, while key brightening actives work to restore radiance.